Born and raised in Georgia, Jason is passionate about science, reptiles (reticulated pythons in particular), genetics, rock climbing, slack lining, mycelium, good sushi, funky beats, gardening, and of course, goats. He is a craftsman and electrical engineer, and a life-long learner. Jason runs operations for Red Wagon Goats, and will likely be the one to inspect your land, set up your property and transport the goats. While Jason and Megan grew up in houses about a mile from each other, they didn't meet until their thirties, at Alchemy 2015. Megan is the marketing and design guru for Red Wagon Goats, and is a self-employed as kibbycreative.com. When not designing brands for her clients or playing goat mom, Megan can be found teaching yoga, or performing across Atlanta with her burlesque troupe. The real credit goes to the goats, they're the heart of the company. They are our pets, our friends, and we are grateful for the opportunity to be their caretakers and share their sweetness with the community. 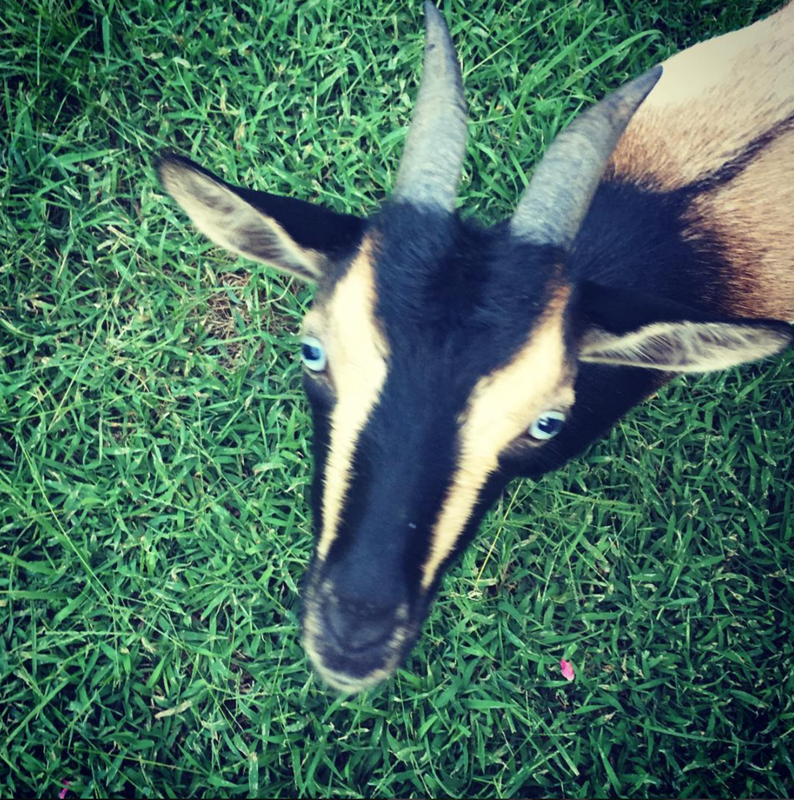 The sire of the herd and the apple of their eyes, Bobby was Megan and Jason's first goat. From the lovable 6 week-old baby goat they brought home, he has become a sturdy, but lovable herd sire. She was a disbudded doe when we got her and is one of the sweetest, most soulful goats. Her nickname is "Big Mama." Our wild child, this spry regal beauty came to us a doeling, but took to heard life and motherhood like a champion. The first baby kidded at the homestead, this mama's girl steels hearts with her big blue eyes and playful, sweet tenacity. 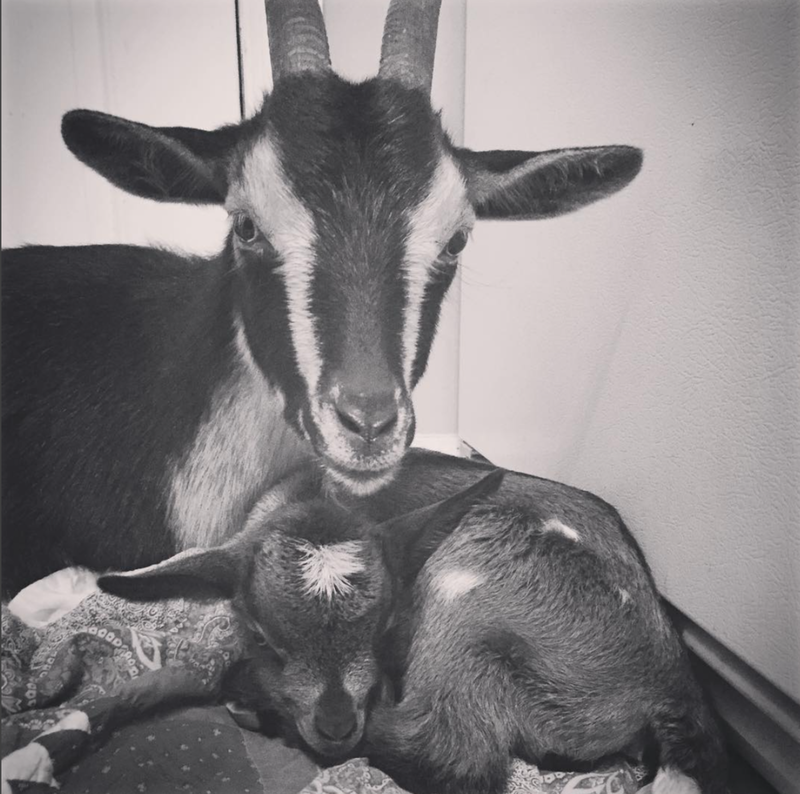 Harley and Boeing were born on a cold cold night, and Megan and Jason were lucky to get to swaddle and bond with them immediately. The twins developed super quickly, and love to scuffle. They are best buddies, very independent, but also very affectionate. Harley has more of Bobby's traits – red hair, one spot, black mane, black ombre legs, lanky with folded, floppy ears. Boeing is lighter –more sable- and has more dwarf features; airplane ears, with a stocky build. Both are cutie pies.